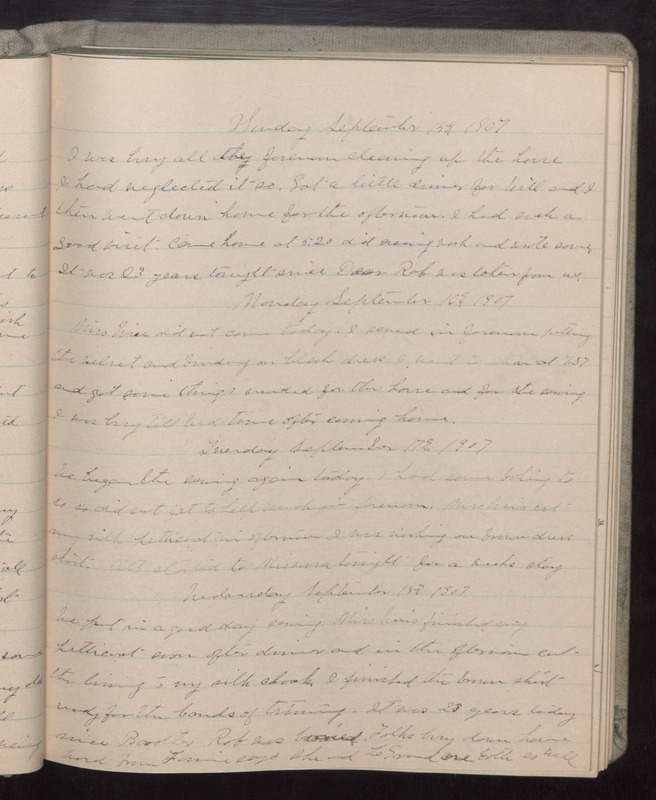 Sunday September 15 1907 I was busy all the forenoon cleaning up the house I had neglected it so. Got a little dinner for Will and I then went down home for the afternoon. I had such a good visit. Came home at 5.20 did evening work and wrote some. It was 23 years tonight since Dear Rob was taken from us. Monday September 16 1907 Miss [Wies?] did not come today. I sewed in forenoon putting the [illegible] and binding on black dress. I went to town at 7.37 and got some things needed for the house and for the sewing I was busy till bed-time after coming home. Tuesday September 17 1907 We began the sewing again today. I had some baking to do so did not get to help much in forenoon. Miss [Weis?] cut my silk petticoat in afternoon. I was working on brown dress skirt. Ott started to Missoura tonight for a weeks stay Wednesday September 18 1907 We put in a good day sewing. Miss [Weis?] finished my petticoat soon after dinner and in the afternoon cut the lining to my silk cloak. I finished the brown skirt ready for the bands of trimming. It was 23 years today since Brother Rob was buried. Folks busy down home word from Fannie says she and LeGrand are both so well.